The concept of using birdsong as a basis for musical expression is nothing new. Composers from Beethoven to Messaien have taken advantage of this ready source, and have produced music that is lyrical, haunting, and even harsh. The bird calls I choose as material are used not necessarily because of their musical potential, but rather because the birds themselves hold some special significance, and in 1979 I began a tradition of writing a piece of music for every new species of bird seen, as a “Thank You” for these special gifts! Some birding journeys would yield over 400 new species (or “lifers”), so writing a piece for every bird was a little daunting, to say the least, so for these mega-trips I randomly chose a dozen representative species from my trip list, covering the major areas visited. In the case of the Ecuador Suite, those areas included the high Andes (Papallacta and Yanacocha), the western foothills (Mindo and the Tandayapa Valley), and the western lowlands (Choco region). I consider myself to be a “classical” musician, but with the purchase of a Yamaha Clavinova CVP-403, the temptation to “play with” the myriad rhythm styles available was too strong to resist, so most of these pieces depart from my normal style by having a “pop” feel to them! A few worked well as “stand-alones”, but I also composed a “pop” version for these as well, which are included at the end of the CD as “Part 2’s”. Whatever your musical preferences, it is my hope and prayer that these pieces will be a blessing and a source of enjoyment to the listener. Probably the most “free form” of the pieces, the Antpitta motif (a series of level eighth notes followed by triplets) doesn’t actually show up until well into the piece, where a strict musical representation of the bird’s song is followed by a melody composed from that motif, followed again by the straight song motif. The motif that begins and ends the piece is actually unrelated to the bird! This was the first of the “play with a rhythm” pieces (all rhythms were selected “by lot” as it were), and the result is rather “funky”, with both the A and B themes playing on the loud, descending song note of this bird. 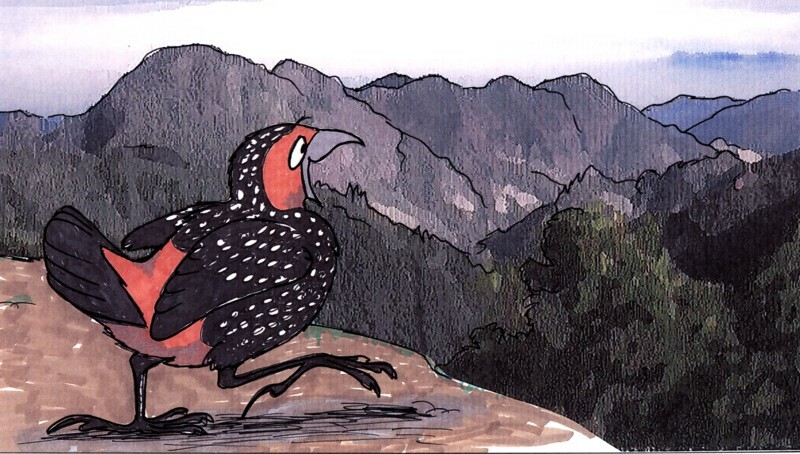 Actually, the bird was never seen this trip, but was content to sing out of sight mere inches from us, so this song conjures up in my mind a cartoon version of the bird bopping happily down the trail at Yanacocha (as reflected in the cover art)! A piece that definitely does not reflect the personality of the bird, the primary motif was taken from the bubbly interaction calls of this delightful little hummingbird, whereas the introductory “morse code” motif (revisited at the end) reflects a different type of foraging call. Rather than being fast and lively, this stand-alone piece almost has the feel of a dirge with a strong emotional build at the repeat of the A theme, then softening once again. This was one of the few birds that easily provided a lovely melody! The bird’s spot-on whistled song speaks for itself, and along with some preliminary call notes, provided the material for both the A and B melodies in a haunting piece with an easy rock rhythm. Everyone’s favorite bird ☺, the “squeaky song” of this parasitic blackbird actually provided a pleasant motif (although the original song is so high in pitch that one has to use one’s imagination to put musical notes to it). Another “stand-alone”, this one reminded me a bit of an obscure selection from Edward Grieg’s Lyric Suite that usually isn’t included in most recordings, and reflects the distant tolling of church bells. The triplet feel and major key of the melody keeps this piece from being as “dirgy” as the Rackettail. I was a little concerned how a song consisting of a wobbly wail up and down the chromatic scale would translate into a musical piece, but it worked! The descending call note helped in the composition of the A theme, and the chromatically-based song helped give a rather sinister (or “sneaky”) feel to the B theme. This one worked well as an easy “walking pace” stand-alone piece, and ends rather like a music box! The main melody of this piece was actually taken from the call notes of this bird, not the song, which like many in the antbird family consists of a series of rising, accelerating notes (which can be briefly heard in the actual recording). The result was a haunting melody that worked well with an easy beat. What a hoot when the Lord picked the “Bolero” rhythm! ☺ (This Clavinova has everything…) I couldn’t help but reflect some of Ravel’s instrumentation in this one, but while I actually have three themes instead of his two (I guess you could count his surprise ending as a third), the piece doesn’t last nearly as long, and to this day I’m wondering if I should have extended it a little! Again, I wasn’t sure how an accelerating, rising song (ending with a “splat” note) was going to play out, but it did! The A theme reflects the bird’s song most closely (with some liberties), but the B and C themes are totally manufactured from the interval (or nearly so) of the last two notes of the bird’s song! A Latin beat was chosen for this piece, and surprisingly the 5/8 rhythm of the B theme worked well with it. An additional three tracks have been added that reflect "pop" versions of the Shiny Cowbird, Booted Rackettail, and Spotted Woodcreeper.